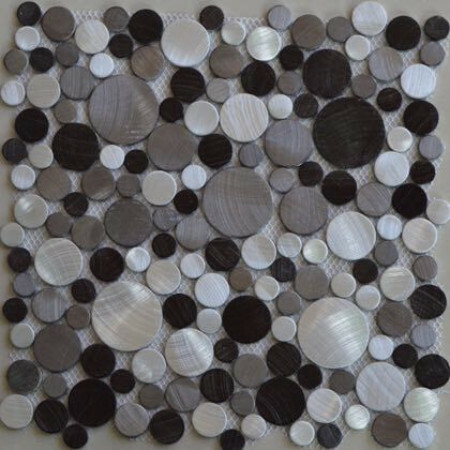 The penny round pattern is a popular design of mosaic aluminum tile that can be used in many applications. The small penny sized pieces create an awe inspiring effect when they come together on a large wall or back splash. Use this tile for metal kitchen backsplashes, accent walls, entrance hallways, office walls, bar areas, bathroom walls, bathroom back splashes, fireplace surrounds, etc. The tiles in this sheet are mounted on a nylon mesh which allows for an easy installation. Residential, commercial and industrial applications.